Ok, I didn't wear this today but I did wear it to a BBQ over the weekend. I just fell in love with this dress! The colors, the comfort and I added a belt I also found to it which made it give me a little bit more of a waist. My friend Edwina and I went to the sale of all sales! 50% OFF everything at Savers. I thought that I was the only one who knew about this but when we arrived (20 minutes early) there were over 50 people already in line with their coffees. The one thing I like to do is check out our competition. If I notice that no one has my style that is a good sign. Because even if they come across a find they are less likely to pick it up! But you have to be careful of lurkers...ladies, you know who I am talking about. The women who kind of follow you around and when you put something back they grab it. Or they ask for your opinion only waiting for you to set it down! BEWARE! I even had a lady tell me that this item I picked up was a little cracked, Lady: " Umm yeah I almost picked that same thing up, but it is cracked, I definitely wouldn't buy it" ME: "Oh I don't care about the crack I think it is super cute!" Lady: Oh well, I would never buy ANYTHING CRACKED" said in a very angry voice. 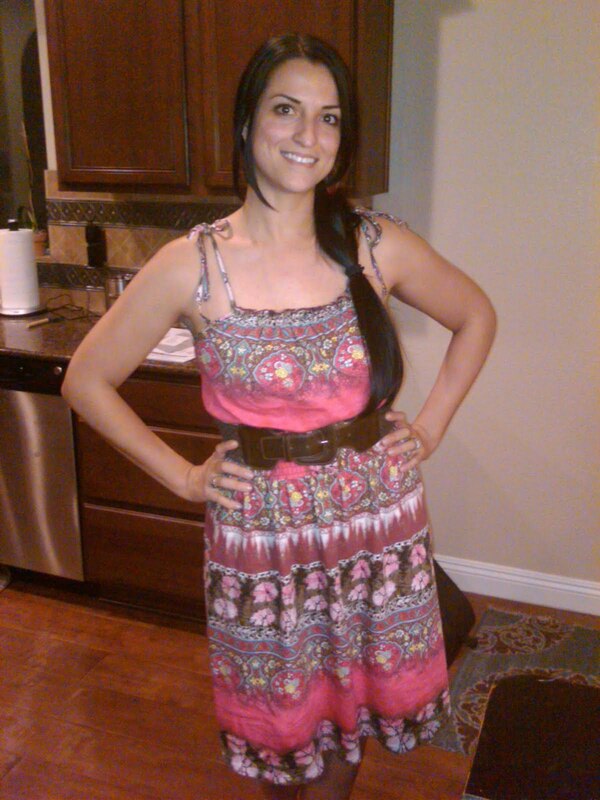 Anyway, back to the dress, It was only $5.99 50% off and the belt was .99 so $.50. Can't beat it! Sorry this is the only pic I have. Wow! What a steal! I am IN LOVE with your hair. You look like a princess. Thank you for warning me about lurkers. They are a beast I have yet to meet. However, I will now be on the lookout for them! You look great. And I agree with Rachael, your hair looks BEAUTIFUL. Thank you! I wish I had more patience to do my hair all the time, but it takes so long it is almost 110 these days! Thank ou for all of the comments!